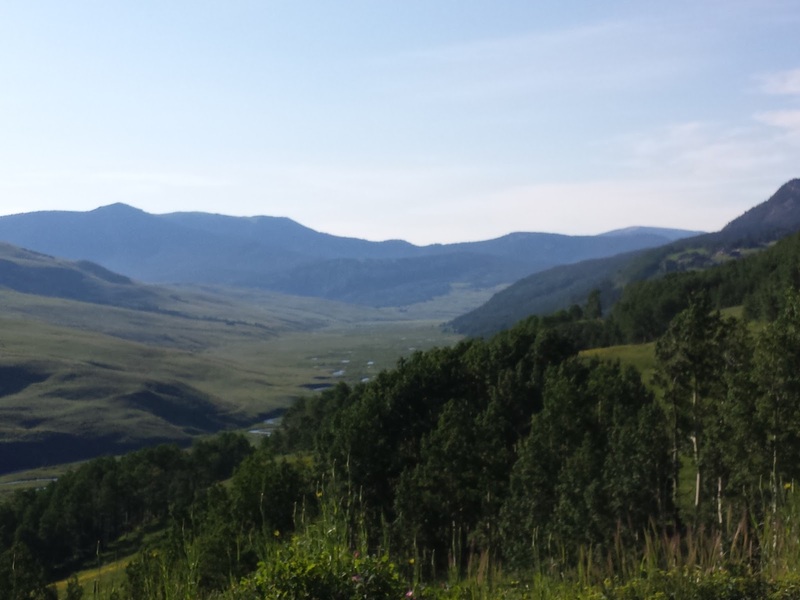 For two years co-workers and friends have told me about this mythical place in the mountains west of Denver. Incredible mountain views straight out of a movie, they said. Fields of stunning wildflowers that go on forever, they promised. 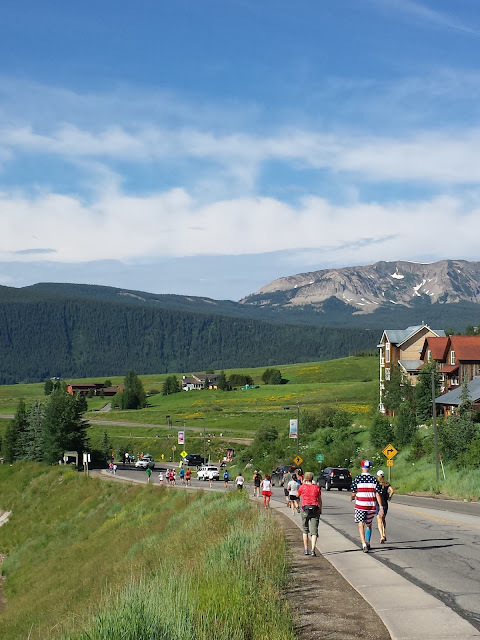 After going on and on about its beauty and a one-of-a-kind race every 4th of July, I was convinced we needed to book a trip to Crested Butte. It was a bit gloomy when we arrived, but it was stunning. They were right. We arrived the afternoon of the 3rd after being on the road for close to five hours with only one quick pit stop. 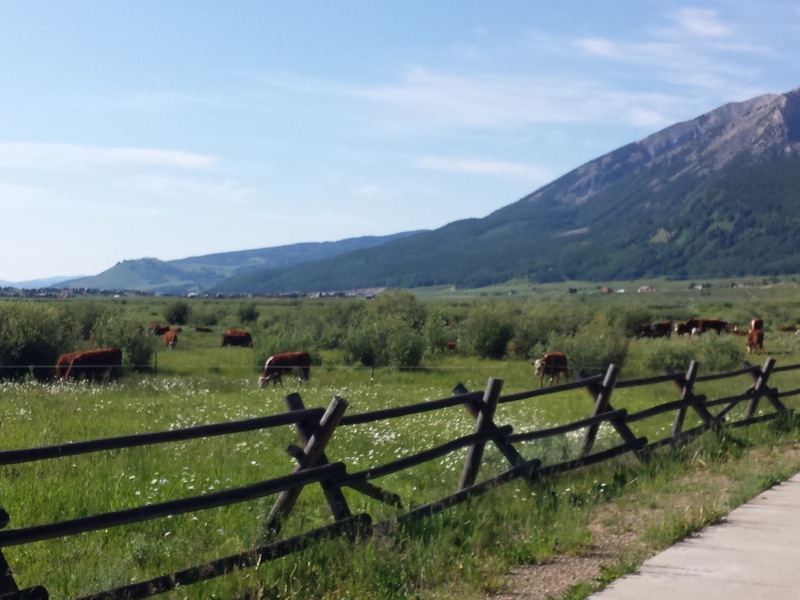 There was an unnecessarily long backup near Conifer but it was pretty smooth going the rest of the way. To be sure, with mountains and plains, the drive is not an easy or boring one. We headed straight to the visitors center to pick up our race bibs and then headed to the little cottage right off Elk Street (aka main street) where we had rented a room through airbnb. I struggled all evening long with whether or not I should do the race. I'd only "run" a total of 2 miles or so since the debacle in Vancouver, and it was all flat surface in Wash Park. 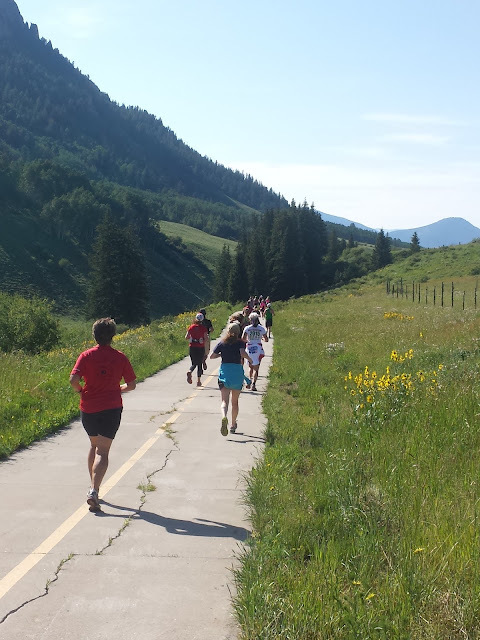 The race we were signed up for was the Gothic to Crested Butte 1/3 Marathon - 3 miles of rolling uphill topping out above 9.700 feet, before 5+ miles of downhill. I had decided not to do it before I learned that a lot of people actually walk it and the race directors allow people to start early. I was still nervous about the distance but around 10pm I finally decided to do it. We may not be back for this race again, I knew the views were going to be incredible and if I started early and went out knowing I'd walk most of it, I could definitely get to the finish line. My plan: walk the vast majority with a few quarter mile "run" segments well spaced out. Woody's not too happy I'm including this photo but it's the only one I have of us at the race so it's in. The Gothic to Crested Butte 1/3 Marathon is a fundraiser for the Rocky Mountain Biological Lab, located in Gothic, and a number of the researchers take part in the race each year. They also participate in the 4th of July parade later in the morning. The race begins on a dirt/mud road, transitions to pavement - running downhill along Crested Butte Mountain resort area - then moves onto a multi-use rec path before getting into town. The roads are not closed to traffic, so it was important to keep an eye out for cars and bikers along the route. The finish line is on Elk Street where locals were staking out their spots for the parade as we were walking to the bus for our trip up to the start line so there was a great crowd. 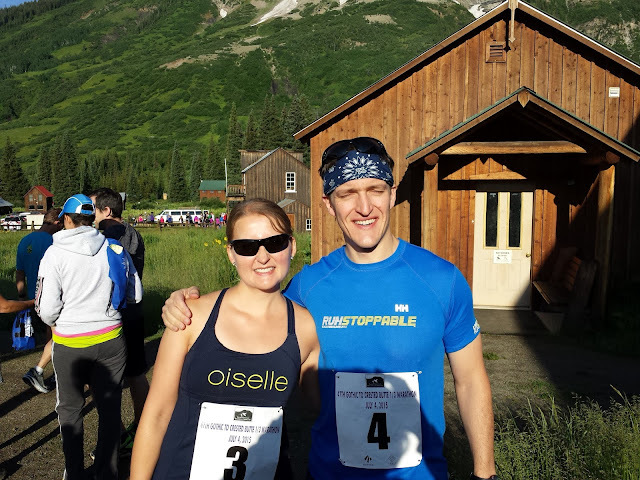 A former co-worker who makes a trip out to CB every year, was in town camping with friends and also ran the race. 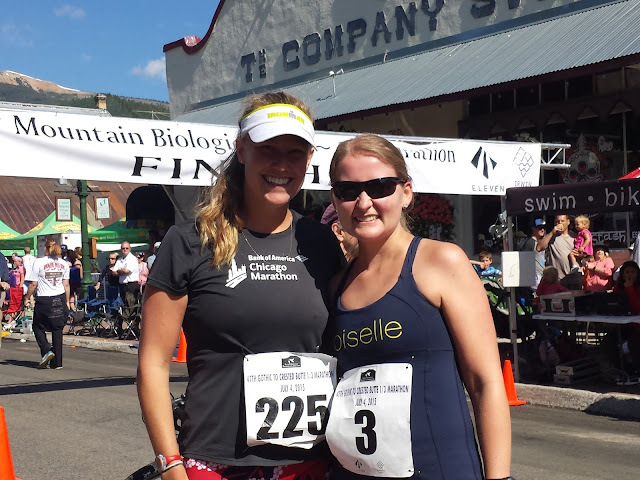 She passed me around mile 2 and went on to finish 4th woman overall! I felt a lot better than I had expected to feel and of course, ended up running a lot more than I had planned to. It turns out that running downhill is a bit easier than walking quickly. I finished quite a bit earlier than Woody had expected. When all was said and done, I ran the 8.62miles in 1 hour 48 minutes and some change. Not bad. My knee didn't hurt but my quads paid the price. The next few days were rough! The race was unlike any other I've run. Aside from the incredible views, like CB in general, it was really laid back. Runners and walkers packed busses that took us from downtown up to Gothic - sleepy eyed and seemingly more concerned about 4th of July celebrations later in the day than the 8.5 miles ahead of us, everyone just went with the flow and were glad the rain had passed and we had a beautiful morning. On our way to the start we probably passed about 50 people, maybe more, who were already on their way down. Most walking, a few jogging, all dodging mud puddles but having a great time. Once I was on my way I passed a few groups, including 4 people who were pushing a jogging stroller. As I came up on them I assumed they had a baby in the stroller, turned out their baby was a cooler filled with beer. Many were dressed up in patriotic gear, as to be expected. I missed the official start but Woody said it was basically a guy who said "ready, set, go!" and they were off. Also, the t-shirts. While great, identify the race is a quarter marathon, which isn't right. I'm guessing there's some inside joke there that those of us who haven't raced it all 47 years won't understand. Final verdict, we'd both run it again. Injury Update: I started seeing a physical therapist last week and have several weekly sessions on the calendar. After doing a few tests and confirming that my knee is definitely better but still needs some work, she did some manual therapy (which hurt) and assisted with some stretches before giving me homework. Hopefully in a few weeks I'll be back to running soon. I have more races on the calendar to get ready for! 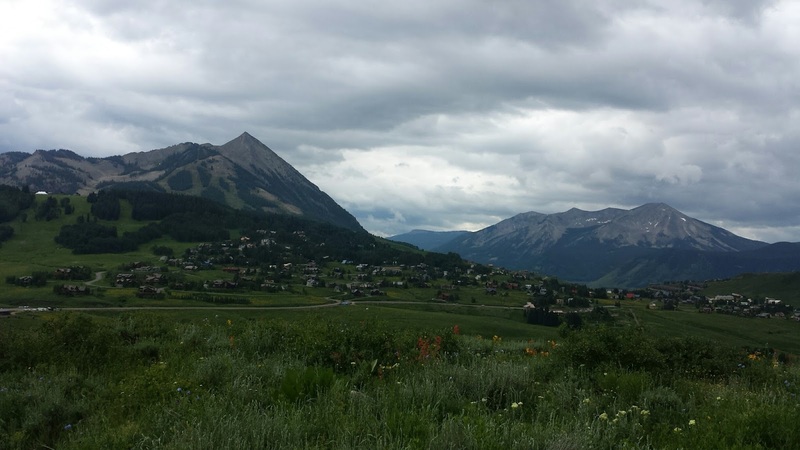 There's so much more to Crested Butte so that'll come in another post. 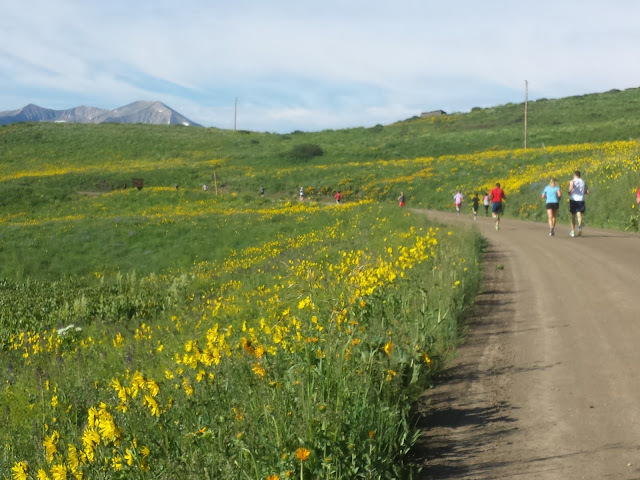 I'd love to hear from anyone who's run Gothic to Crested Butte! How did you celebrate the 4th? Are you proud of a recent race or run performance? 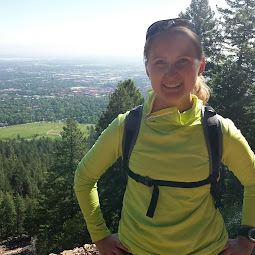 After living in New York City for 9 years, my husband and I moved to Denver in 2013. 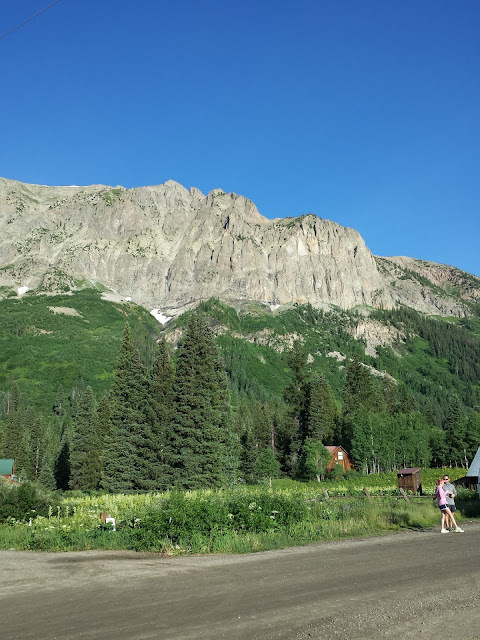 This blog is about exploring Colorado (and beyond), running, trying to live a healthy life and so much more! Thanks for stopping by!